826CHI is a great nonprofit organization that provides free tutoring, workshops, and creative programs for students from 6-18 years old. It’s part of Dave Eggers’ empire of similar programs in New York, San Francisco, Michigan, Seattle and Boston. Eggers, of course, is the whirlwind writer / impresario behind A Heartbreaking Work of Staggering Genius, McSweeneys, the Where the Wild Things Are movie, The Believer magazine . . . really, too many projects to count. The front of 826CHI is disguised as “The Boring Store,” a kind of ersatz emporium for spy equipment. A clever facade, for it’s in back where the real action happens: creative writing workshops. 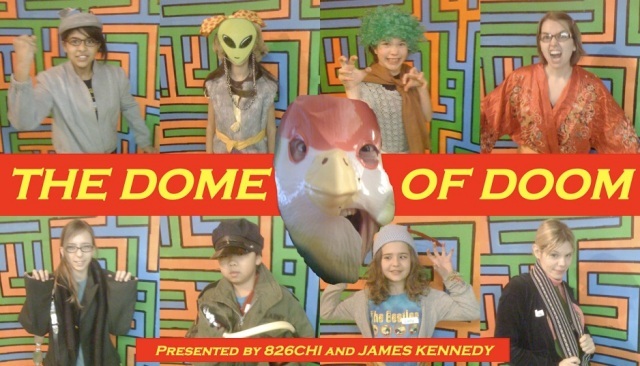 When Mara O’Brien gave me a chance to do a Dome of Doom writing workshop at 826CHI in February, I happily accepted! First I read out the scene from The Order of Odd-Fish in which Jo and Fiona, as part of a dueling ritual, dress in costume armor as gods from the Eldritch City pantheon and exchange bombastic threats and insults before fighting. Then the students invented their own Eldritch City gods, rummaged through chests of costumes to put together costumes to look their their god, and wrote their own baroque, ludicrous Eldritch City-style insults. We then put on our own “Dome of Doom” style tournament in which the students paired off, announced the name of their god, exchanged their threats, and then dance-fought each other to insane fighting music! I’ve done this exercise at many other schools and libraries, but I never thought to videotape it. Special thanks to fellow Brother Delacorte Adam Selzer, who kindly helped out with the video and interviewing of the fighters! Adam’s latest of many, many books is the paranormal-romance satire I Kissed a Zombie, and I Liked It, which I’m in the middle of reading now, and apparently caused a bidding war for Turkish rights! Thanks also to Julia Brenner and Julia Lobo for assisting and for jumping into the ring. And, of course, thanks to all the brilliant fighting gods of 826CHI who rose to the challenge! Check out the video above, especially if you like to watch insane costumed gods insult each other and then battle-dance to the likes of Deerhoof, Hot Snakes, Crystal Castles, Polysics, Igor Stravinsky, and Bollywood soundtracks.